Order High-Quality 11×14 Prints Online Or From Your Phone In Minutes! 11×14 enlargements have an aspect ratio similar to an 8×10 photo, so they are perfect for all of your large format printing needs. Great for hanging on your walls in most common areas, 11×14 photos will liven up your home with memories. When you want to order cheap photo prints online, MailPix offers a wide range of photo print sizes at the most affordable prices! 11×14 photos are available in Glossy or Matte Finish. Glossy Finishes has a gorgeous vivid colors with a high contrast appearance that enhances fine details and truly makes the colors stand out. This coated paper has a very smooth, highly reflective surface that is slick to the touch. A glossy finish is a better choice for those who want to print and maintain everyday snapshots. Matte Finish is a velvety non-glare and non-reflective surface that is highly resistant to fingerprints and smudges. Realistic colors and flesh tone reproductions are combined with a lower contrast appearance that enhances the texture of your photos. Matte finish is better if you want to feature black and white or sepia colored photos. Looking for more picture print sizes? 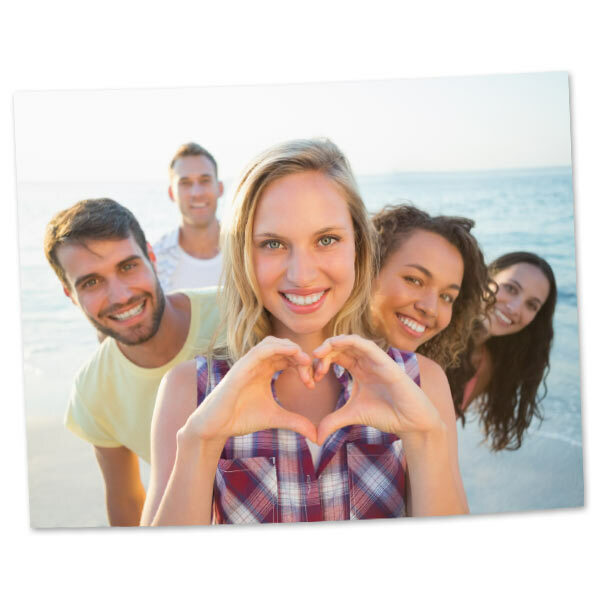 Order 2×3 photo prints for sharing or 16×20 enlargements to frame on your wall. If you can’t decide on a favorite photo, our collage poster option is available in an 11×14 size as well. Upload your photos and create your own layouts to create picture-perfect wall art for your home!